Thank you so much for all the effort you put forth to make our river trip special. We cannot imagine how our experience could have been better. The weather was beautiful, the river was exciting and serene, and the scenery in the canyon was stunning. But it was you and your crew that helped to make this a trip we will never forget. Our group of 13 will be pleased to recommend you to anyone interested in a fabulous journey through the wilderness. You’ve built a great company based on the values of hard work, respecting the environment, and taking good care of people. I had a great time on this trip and appreciate all the effort you’ve put into building Hughes River. Want to thank you for the best river experience ever! The kind, knowledgeable guides and delicious food plus the scenery of the Middle Fork were all amazing. We plan to sign up for a 2017 trip down the Lower Salmon! Every one of our group agrees that it was a trip of a lifetime! Idaho is spectacular and our trip over to the Middle Fork exceeded all expectations. The guides were professional, helpful, insightful, and most importantly great fun. I cannot praise all your guys enough. We all left with great memories and ideas for return trips in the future. We found that Hughes River Expeditions has a great reputation out there. Many of the people we spoke to in Stanley, along the river, and even in Boise could not praise you guys highly enough, and I can understand why. Great job! We’ll be recommending you to anybody looking for an adventure of a lifetime! As you may have guessed, our expectations with regard to rafting the Middle Fork of the Salmon were extremely high and, to a person, your organization exceeded these expectations on our float last week. I want to commend you on your exceptional planning and the faultless execution of the plan. I must compliment you on the outstanding crew that took us down the river. These guys are, in our eyes, the absolute best!! They did a great job in every area. They prepared excellent meals, had camp ready each day when we arrived, made each person feel comfortable and safe, and of course, got us down the river in one piece! It was amazing that everyone in the group thought their boatman was the best. I would like to extend our thanks for an outstanding experience. The crew we had on our trip was absolutely great—fun, interesting, entertaining and each one had the uncanny ability to anticipate our every need. We are home again and still rocking a little bit from riding down the Middle Fork. It was a great trip made especially pleasant because all of your staff were first class. They gave us great confidence in the river and then took excellent care of us ashore. I gained four pounds. Summed up, our first river experience was wonderful. I’m only sorry we waited twenty five years from our first plan to ride “The River of No Return”. We both had such a wonderful week – it will definitely be a vacation that will have an important place in our memories forever! It’s been hard to express to our friends and family at home just how perfect the trip was – you can’t imagine how beautiful the scenery is til you are thrust upon it. I lie in bed at night thinking about the Screech Owl talking and the two huge storms with real lightning and thunder that shook my safe tent. I was so excited to see the Black Bear under the tree so relaxed and the great Big Horned Sheep down drinking water out of the river & groups of sheep way up high on the side of the mountain. The one River Otter that smiled at us, then dove under the rocks. My daughter and I had the most wonderful adventure… I can not thank you enough for the opportunity to live outdoors in comfort for the better part of a week in the wilderness. The entire crew was meticulous about the environment and care of the ‘guests’. I never worried about the safety of my 10 year old because all of the guides were cautious and capable. I also appreciated the fact that she could observe their concern for our natural surroundings. What I really wanted to write about is how, once again, the guides were what made the trip. Of course the river, the rapids, the scenery, the food, etc. was stupendous, but the collection of extraordinary people is what we’ll remember most. They all work incredibly hard but never made any of us feel they are inconvenienced. They not only made lifelong memories for us but really have played a part in the development of our children. Their gift will always be treasured. I’ll let them tell you what award each of them earned at “River Awards Night”! I’m writing to let you know how much I enjoyed my Middle Fork trip last week. It was one of those rare experiences where the reality is better than the expectation… Your gear, food, arrangements, meals, and guides all combined to make it a tremendous wilderness experience… Aside from the natural beauty, the best part of the trip for me was the guide crew, their courtesy, their tremendous river skills, their cooking acumen, and their quiet leadership. Thanks for selecting and supporting such wonderful people. I hope to join you again soon on another trip. It was great meeting every one of you. You all helped make the river trip exceed my lofty expectations. Thanks!! And-good news-since the trip, I have almost broken the habit of walking 20 feet away, turning my back and then pee-ing. Our families had a great, great time. The Middle Fork and the 6 days out gave individuals and families a time to gain a sense of perspective and reconfirmed unity. I could go on and on about the benefits… but you all know them. Aren’t we fortunate? We just wanted to thank you for the trip of a lifetime (although we plan to try again next year). We had a marvelous time on the Middle Fork. Your staff was incredible. The entire experience was life changing. Thank you for sharing the beauty of Idaho. Thank you for introducing us to some wonderful new friends – the guide crew… You will hear from us soon when it’s time to make reservations for next year. Thank you for a wonderful raft trip! There are so many important ways that you, as individuals and a group made it the best experience anyone could have. Of course, the food, facilities, organization and expertise were impressive. What really made it a special trip was you people personally. Each one of you work so hard and cheerfully, clearly like and enjoy one another, and freely give of yourselves in thoughtful ways… you can bet I’ll recommend you highly to anyone considering a raft trip. What a wonderful job you did… we are in awe of your efficiency and genuine love of nature, people, and your job. Spent lots of time sharing photos and trip stories with our friends. At no time in the past have I written a provider of a service…and told them what I thought. But, as we were coming to the take out point on our float trip, I vowed to write to you… To start with, we had an experience of a life time! Each individual in our group has independently expressed how amazing this experience was and at least one told me it was life changing and healing. Taking the approach where you did whatever it took… generated good will among our group…big time kudos to you as a founder/leader … and to your ability to rally some amazing people who make up your good organization. Thank you for an incredible week and please keep on keeping on with what you do so well. You’ve got some fans out here. We really enjoyed our trip this past week on the Middle Fork. My daughter, Barrie (6 years old) had a great time. I don’t think I have ever seen her have as much fun. You have put together a terrific group, beginning with Kim in the office and extending to the field staff. The guides were wonderfully professional, going well beyond what was needed just to do their jobs. The River and it environs are magnificent, and the commentary, friendliness and support of the individual guides enhanced the experience considerably. Our family was extremely pleased by our trip! ….We enjoyed all the guides. They are fun loving, very cooperative group and so nice to our children…Each guide was a unique and accomplished individual – it was great to get to know them all…your staff became family. Joyce and I just wanted to say thanks again for the great trip. Everyone had the time of their lives. My kids and I were lucky enough to take a six-day river trip with Hughes on the Middle Fork of the Salmon July 16-21. We had heard so many good things about your company over the years that my expectations were set very high. They were exceeded in every respect. Our guides made the trip even better. We feel luck to have experienced the river with such good people. My 16-year-old son had a blast and said it was the best trip of his life. My 12-year-old daughter did not want to be on any river, for any reason, at any time and she ended up having an “awesome” trip…We can count her as a convert. Words are really insufficient to match the experience, but in short it was amazing, incredibly fun and moving. We will never forget it. How fortunate we all were to be with Hughes on this biggest adventure of our lives. When the 6 of us got back to Boise last Thursday night, we agreed it was the best vacation we had ever had. Thank you for providing the ingredients that made it so wonderful. Your boatman crew is superb… The food was over-the-top good…. We never felt rushed – the pieces of each day seemed to fit just right… We learned so many new things and were challenged to try things we’d never done. What a memory we will cherish. Thanks again to you and your crew for a great trip August 9-14. 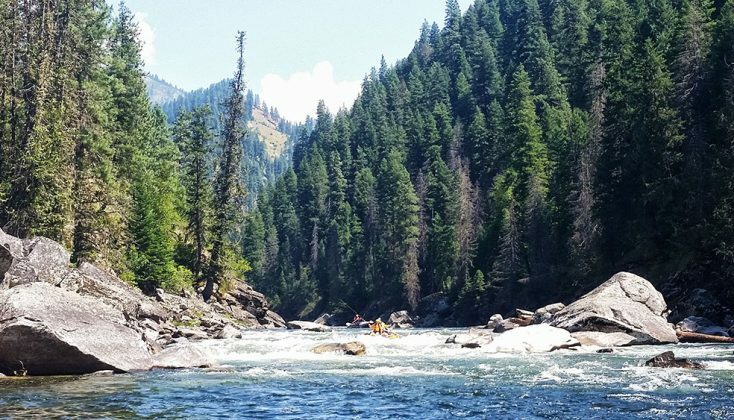 We just wanted to send you a note to tell you what a wonderful time our family had during our trip down the Middle Fork of the Salmon River on August 17th-22nd. We could not have asked for a better group of guides. Each and every one – Joel, Marshall, Aaron, Bob, Ryan, David and Eric was terrific. The guides worked and played continuously to provide our family with an unforgettable experience. The patience they had, and the rapport they displayed, with all three of our sons was unbelievable. We found your company to be first rate, from the guides, to the equipment, to the food. The entire journey was well organized and stress free. Thank you for a once-in-a-lifetime experience. 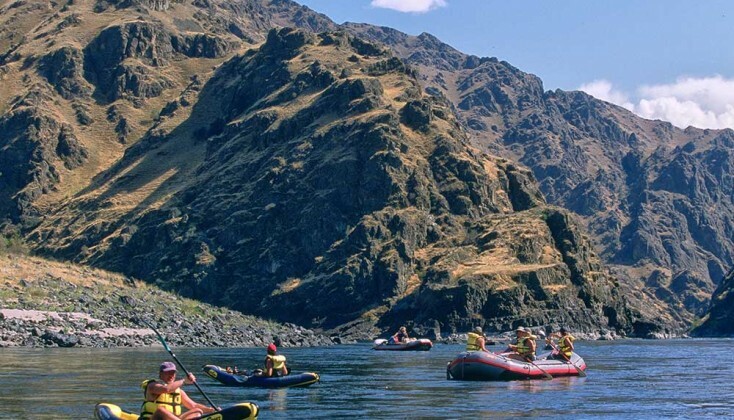 We hope to travel with you again in the future; our kids are already asking to do the Hells Canyon trip! 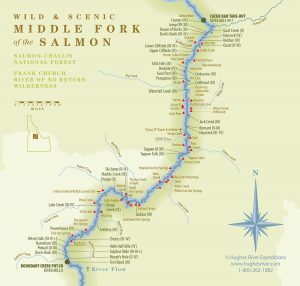 Please convey to Carole, to Jerry, and to all the wonderful guides and staff, my appreciation for a truly first-class trip on the Middle Fork. It really did exceed my already high expectations and I look forward to doing it again someday. You guys and gal did a superb job of making this trip enjoyable and memorable. We admire your skill, your friendly demeanor and, especially your teamwork.You made us feel special! Thanks again for sharing your summer with our families. You made a special time and place more special. Thank you again for a great trip! It was a real privilege to be in such a beautiful place with wonderful people. The guy playing the flugel horn was fantastic too! We are easing back into the real world after a wonderful week on the Middle Fork. We had high expectations based on the experiences of friends who have floated with Hughes as well as your very own testimonials. And we found out that everyone – even you – understated it! This was a trip that will not soon be forgotten…I will remember my first-ever sighting of bighorn sheep, Bill will remember his first attempt at fly fishing and of course, there was the camaraderie, great food and total relaxation. It was a great feeling to be in a place where the only Blackberries one might find are the ones found on bushes. And the guides? Well, they are seven good reasons why your company has such an outstanding reputation. Not only are they experienced boatmen who put safety first, they show a reverence for the resource and remind us all how it is to be protected and treasured. And they are pretty good cooks, too! Thank you, Jerry and Carole, for taking such good care of us. I hope to enjoy another Hughes trip again soon. Thank you for another outstanding trip. You guys always go the extra mile to make these trips awesome! Buzz, Aaron, Marshall, Matt, and Colin were fabulous guides (as always)! The company, the food, and the wilderness – you couldn’t ask for anything better! Thank you so very much! I would so much like to be back on the river, listening to the calming (and rushing) water, soaking up the sun and fresh air, enjoying the solitude and peacefulness …with good friends. We had a blast and enjoyed the true wilderness experience thanks again for everything. Thanks for the great river trip. The people on the trip and the guides were wonderful and entertaining. Food was fantastic, and of course, the scenery and fishing were great. On a scale of 1-10 I give the trip a 15!… Hope to see you on the river next year… Run river run! We had a wonderful time in July on the Middle Fork. You had a great group of guides. We would like to go ahead and reserve the July 4th week of 2012 if it is not already taken. I will get you names of the participants as we get closer to the date. Thanks guys you were great. We had a fantastic time! Hopefully we will see you again soon! Thank you for putting together such a great trip. You and your crew do an outstanding job of hosting a river trip. I think the biggest difference for us was the way your folks interacted with the guests essentially 24/7. We appreciated that aspect of the trip as much as anything… Again, thanks for putting on “a very good show” for us and TNC. We look forward to being on a river with you and your crew again. Thanks for another world class trip! … All the best! This song was performed for the guides the last night on the river July 21, 2012. You can count on me and my “suspect river behavior” to be back soon! I had a great time. (We) just got home from Stanley, where we spent three lovely days trying to prolong the magic of our Middle Fork journey. Being back in New Jersey, we feel a sad ache in our hearts missing the beautiful river, mountains, and the new friends we made….Thanks so much. The power of the wilderness and the river will stay with us for a long, long time. Thanks for another great trip. It’s always great to see you again. The guide lineup was spectacular. I especially enjoyed getting to know Colin a little bit better. What a great guy! I will be in touch sometime in the near future to discuss our next Hughes’ river adventure. Thank you and your staff for providing a once-in-a-lifetime, wonderful experience for our 12 friends, my husband Andy, and me! All your guides were so pleasant, accommodating, and just down-to-earth, good hearted, fun loving gentlemen. Of course the scenery was breathtaking, but our enjoyment of our surroundings was only made possible by our guides, under whose guidance we were able to sit back and enjoy the ride! We all had so much fun, many laughs, and beautiful memories that will last our lifetime! Still thinking about our wonderful trip with you all…what a gift! Rawlin told me just this morning that he’s decided that he wants to go rafting for his birthday next year too. He mentions the trip at least 3 times a week. We loved it! What a GREAT TRIP! 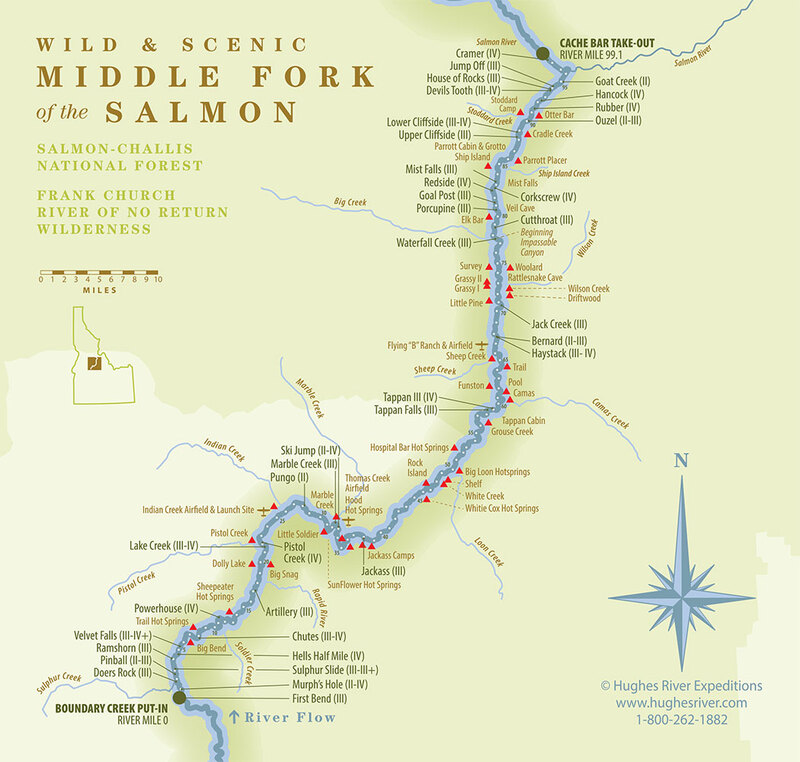 Your crew did a super job of showing us the Middle Fork and all it’s points of interest. 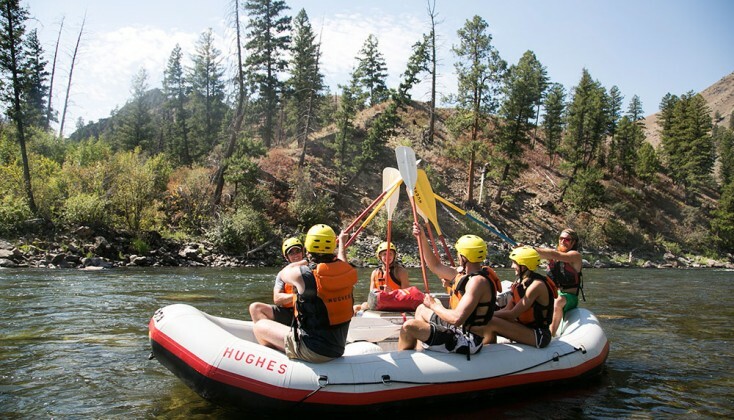 Serving us 5 star meals, accommodations and service… The kids all had a great time and I think have a little more appreciation for the beauty we have right here in our back country of Idaho. I can’t say enough positive things about our trip and experience (Middle Fork August 1-6), and about the Hughes guides – every one of them. Thank you so much Jerry, and our sincere appreciation and thanks to Colin, Tony, Bob, Josh, David, Marshall, and Mark. It was truly amazing and lifetime memorable for us – no doubt about it! We will be back for sure. Mark and I wanted to thank each of you for an incredible trip this year. As you know, we have done many, many rafting trips and we all agreed that this one was one of the best if not the best we have ever done. The reason that it was so amazing was all of you! Thanks for hanging tough with our unruly group and leading us all on a fun filled and certainly action packed adventure! The only way I can start this email is by telling you what a great time I had with you and your crew on the Middle Fork trip. There is no part of the trip I didn’t enjoy… Your crew, the fishing, the food, and most importantly the company was great… Please keep me on your list so I know what trips you are planning. I was thinking about our trip again last night – and wanted to take this opportunity to thank you for such a wonderful trip on the Middle Fork Salmon! You and your entire crew were wonderful.